My main message was pessimism since neither Donald Trump nor Hillary Clinton support genuine entitlement reform. Then Sweden began to lose ground. Some of this was understandable and inevitable. Sweden didn’t participate in World War II, so its comparative prosperity during the war and immediately afterwards was a one-time blip. The seventies and eighties saw Sweden’s tax burden rise from an average European level to the world’s highest. The public sector expanded vastly. All facets of the welfare system were made more generous in international comparison. Meanwhile, labour market regulation increased… Throughout these years, Swedes’ individual after-tax real income stagnated, private sector job creation ceased, and public debt spiralled higher. This culminated in a severe economic crisis in the early 1990s. By then, Sweden had fallen to 14th place in the GDP per capita rankings of OECD countries. When the onset of the financial crisis coincided with election of a market-oriented centre-right government in 1991, the reform process began in earnest. Most emphasis at the time was placed on reforms that opened significant sectors in the economy to greater competition. Moreover, an important feature of these regulatory reforms was that the crisis spurred local authorities to implement less burdensome regulation. …significant changes were introduced to the tax system, macroeconomic policy framework, and social insurance system. …every aspect of the Swedish economy has changed due to implementation of reforms. …public sector employment has declined. Sweden’s seemingly improved performance in the last decade has perhaps more to do with what it’s been compared against. Most of those other advanced countries it is compared against also have veered more towards statism with ever increasing percentages of GDP being consumed by their respective governments. In more technical terms, growth (i.e. the rate of prosperity increase) does not depend on the *rate* of government increase (or decrease) but rather on the total accumulated burden of government. It does not make a lot of sense to me to correlate rate with rate in this case. 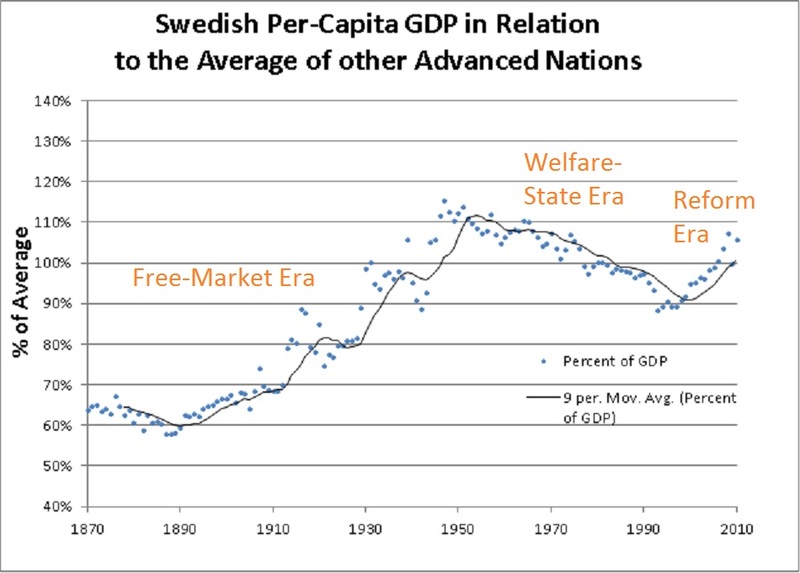 Sweden, in spite of its more recent free market reforms remained and remains a more statist and coercively collectivist society — and its growth compared to the world average clearly shows that. In the end, only that metric, growth relative to world average, really matters. In other words, Sweden who somewhat reversed her government weight from heavy to moderately heavy did better than the other developed nations who continued on their ever bigger government path — but all developed countries as a whole lagged pathetically behind the world growth trendline. ‘Any developed country that aspires to maintain its prosperity ranking in the world must grow at least as fast as the world average’. Ok, subtract population growth if you want to be more exact. So, yes, it is possible for a developed country that follows free-market supply side economics to grow at four-five percent a year and outclass the world averages. As a matter of fact this is the only way a country CAN remain in the developed world — as the voter-lemmings of most developed countries are about to find out in a mere few decades. It is just that save a few spec on the map countries (which by virtue of their small size provide little data) such free market supply side economics countries do not exist. Only those countries that become so have a chance to remain in the developed world. The rest will tighten their vicious cycle of “statism-decline-malaise-more statism”, with HopNChange, presidential preferences based on race and gender, and Trump statism. A corollary to that is that in the past a country with a two percent growth trendline was probably on an ascending path in world prosperity rankings — because back then average world growth was one percent or less (this relatively higher growth is actually how America rose to the top of the worldwide prosperity rankings). But things have drastically and irreversibly changed in our modern technologically driven era. Worldwide long term growth has been trendlining around three to four percent for a couple of decades now. This seems irreversible as technology spreads and, as a matter of fact, is likely to further accelerate as the century progresses. The bottom line is that developed countries who cannot match the three to four percent annual growth rate will soon stop being developed countries by the fast rising standards of the future. A two percent growth would have been stellar in the late nineteenth and earlier twentieth century when world growth averaged one percent. Today with the world averaging three-four percent a growth trendline of two percent is tantamount to deterministic decline. A European growth trendline of one percent is even faster decline. At this growth deficit most European countries will find themselves in the middle-income country group by 2050. The US by the latter part of this century. P.S. Perhaps the fact that Sweden did not participate in World War II had also something to do with the fact that it was a more free market society. While many factors play a role in participating in war (you don’t have much of a choice if you are invaded by the nazi) being a society that elevates the individual above society goes a long way towards correlating with warfare avoidance — since warfare is the quintessential endeavor of coercive collectivism. The collectivism whereby the collective not only confiscates a portion of your vitality, but rather confiscates your whole life — and often leaves it behind in the battlefield: “Thank you very much for your life, you’re not here to complain any more — and more importantly here to vote. We’ll remember you once a year as we, the surviving who sent you to battle, display our patriotic credentials to each other”.